It is so exciting to hear stories of what God is doing in and around the Pioneer Network. We wanted to take this opportunity to share the story of what God has been doing in Burton with The Community Church as told by Dawn Charles & Scott Pettingale who lead TCC as we hope it will also inspire and encourage you as it has us. “We’d like to share our story of what our amazing God has been doing with The Community Church in Burton upon Trent over the last twelve months. This isn’t a story about superstar Christians, it’s a story of an ordinary group of Christ followers putting all of their Hope and Faith in our extraordinary God. Last September we wrote a vision of our church in 2020. We started to dream about what ‘A Week in the Life of TCC in 2020’ could look like. Something happened when we sowed that vision that sparked faith. In January, we asked the whole church to join us in 40 days of prayer and fasting, asking God for a breakthrough of “His Presence” in our gatherings, a breakthrough in our worship and prayer, a deeper understanding and activation of the gifts of the Spirit and we asked for breakthrough in finding our own building. Having met in schools and hired venues since our start, we have been looking for a building to use 24/7 for about 15 years. Previous leadership teams have been to view all sorts of properties around Burton and for one reason or another the door always seemed to be shut. Two weeks ago that all changed when we completed the purchase of an old Methodist chapel. Our first permanent home! Built in 1907 in our suburb of Stapenhill, right in the heart of the area that God has asked us to pastor, the building was purchased in 1972 by the Catholic Church and has been an active congregation of around 40 people up until April of this year. When it was decided this year that the congregation at that Catholic church was no longer viable, they were desperate to keep the building as a church, but had to place it on the market. In May this year it looked like another church, with much deeper pockets than ours, would submit a higher offer and so we resigned ourselves that this wasn’t the one for us. Then Justin Welby randomly came to Burton and gathered the church leaders in the town for an afternoon to share his heart for evangelism. It gave a unique opportunity for our leadership to spend the whole time speaking with Father John Paul, the Catholic Priest who would ultimately make the decision on the sale. After giving our very best pitch about TCC, explaining our vision for the building and our passion to see our community of Stapenhill transformed by the power of God, as well as talking about how we could serve him in setting up Alpha, he decided to set a deadline for all other offers for the building to be submitted. The deadline was set – for the next day. The following Monday he phoned us to tell us the building was ours! It would take too long to list all the tiny miracles that have happened throughout this journey: from being told that our CIO number would take 4 weeks and it miraculously arriving the morning we needed to submit our mortgage application, to holding a Giving Sunday and our congregation of around 80ish (not wealthy) people giving over £100k. One of our CAP clients emptied their purse of £1.86 into the Giving Box, as the congregation sobbed at this very literal Widow’s Mite. Faith has risen and we believe this is the first area of breakthrough for TCC. Everyone is buzzing and so excited about what God is doing. 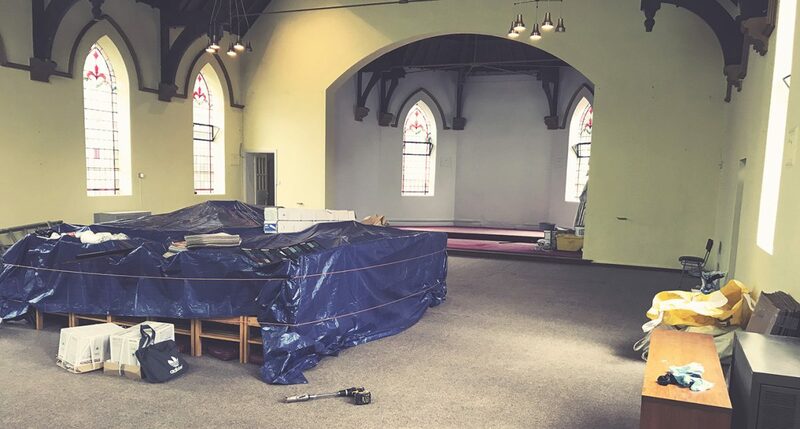 So, as I write this, we are two weeks into the development of the building and the whole church has rolled up their sleeves and are painting walls, fitting kitchens, plumbing in toilets, digging gardens, making tea, painting fences… It’s absolute chaos! But it’s our chaos! For the first time since 1994 we have our own home! It’s not perfect – parking is terrible, we don’t quite have enough rooms yet, but it’s an absolute gift from God and an incredible resource, which will transform how we serve our community over the next few years and allow us to meet some of the needs in our patch of Stapenhill. Dreams and visions are exploding with plans for 24/7 prayer rooms, lunch clubs, CAP Job Club, youth groups, alpha lunches, baby and toddler groups, cooking on a budget courses, quiz nights, worship nights… and so much more! We’ve also seen pockets of prayer breakout throughout the church and a new passion and energy in our Worship Team. Having just finished the book “Everyday Supernatural: Living a Spirit-Led Life Without Being Weird’ which we’ve gone through as a whole church, we are just starting to see the fruit of that breakthrough with many more people actively living a spirit filled life. Were so excited to see what that looks like now we’ve got a tangible presence in the community. Never give up on believing the promises of God for your life and your church. We can testify that through humility, prayer, fasting and listening for the voice of the Father, He opens the right doors and makes a pathway through the wilderness.